Listen. Can you hear it? It’s the death knell for no-carb mania. That’s right. Across the nation, pasta sales are up. Maybe it’s because we’re trying to save time and money. Maybe it’s because it’s so easy to make. Or maybe it’s because there’s nothing more comforting than a belly full of pasta, especially rich, creamy, cheesy pasta. So the next time you’ve had a hard day at work, treat yourself to a bowl of Fettuccine with Sun-Dried Tomatoes, Arugula, and Italian Creme. Made with robust sun-dried tomatoes, peppery arugula, and savory Philadelphia Italian Cheese & Herb Cooking Creme, a spoonable, easily meltable cream cheese seasoned with Italian herbs and parmesan cheese, this pasta will leave you soothed and satiated. You can find my Fettuccine with Sun-Dried Tomatoes, Arugula, and Italian Creme recipe along with a collection of blogger's recipes at The Real Women of Philadelphia web site. That’s where Paula Deen and PHILADELPHIA CREAM CHEESE have joined forces to find their next big cooking star. Even though the contest is over, the community lives on. Go to the Real Women of Philadelphia site and check out the finalists’ recipes. Then come back here and tell me which one(s) you liked most or wanted to try. I’m betting you’ll find some great recipe ideas for your family, just like this one. 1. Bring a large pot of salted water to a boil. Add fettuccine and cook 8 to 9 minutes, or until al dente. Strain, reserving 2 to 3 tablespoons hot pasta water. 2. While the pasta is cooking, place sun-dried tomatoes in a small bowl of warm water for 5 minutes. Remove, pat dry, and slice into strips. 3. Return pasta to the pot. Add arugula and hot pasta water and stir until arugula is just wilted. Add sun-dried tomatoes, lemon zest and juice, and Philadelphia Italian Cheese and Herb Cooking Creme. Stir until evenly coated. Transfer to a platter, and sprinkle with grated parmesan cheese. To check out more wonderful blogger's recipes, visit the Blogger Round-Up page! That dish looks fantastic! What gorgeous flavors. I am so glad the no-carb fad is over! I know I for sure couldn't live without pasta, especially not with creamy sauces like this! Delicious! im so hungry! this is what i want to eat for diner. 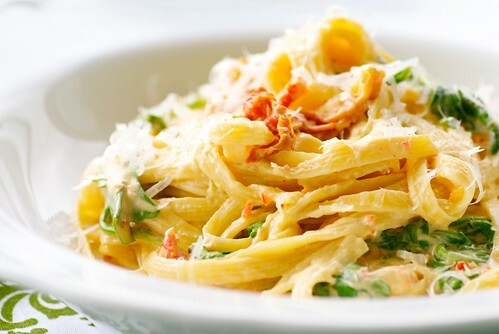 Thanks for this recipe for the fettuccine with sun-dried tomatoes, arugula and Italian crème. It looks quite mouth-watering. Nice! Always loved sun dried tomatoes, and who couldn't use a little more time! That looks sinful and fresh! I wish we had Italian Creme here in India. 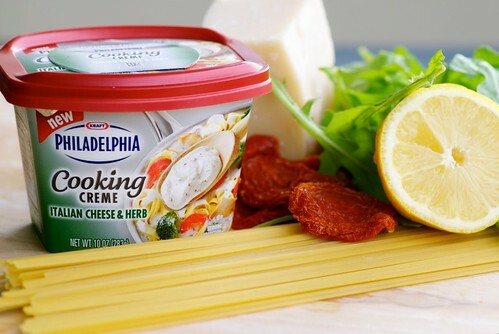 I could never go carb-free because I could never do without the delicious comfort of pasta :) I've been hearing about the Philadelphia cooking creme and it looks pretty awesome in your dish! joanne-Me too! Life is too short to not enjoy pasta. twicebitten-I hope you had it and enjoyed it! TW-I always have a bag or two in my fridge, usually sent from Mom and Dad in RI!